Tamlyn Currin’s review of ‘Essi Avellan’s Champagne’ was published at www.jancisrobinson.com of December 18th 2017. Here is a link to the original article. Essi Avellan’s wine credentials are as glittering as the wine she writes about. As Finland’s first Master of Wine, she won the Lily Bollinger Medal for best taster, the Tim Derouet Memorial Award for best overall student and her dissertation was on single-vineyard champagne. She was responsible for revising and updating the third edition of Tom Stevenson’s Christie’s World Encyclopaedia of Champagne and Sparkling Wine , and is on the tasting panels for FINE, The World of Fine Wine, Decanter World Wine Awards (champagne chair) and the Champagne and Sparkling Wine World Championships. She is a Dame-Officier of the Ordre de Coteaux de Champagne and Commandeur of the Commanderie de Bordeaux. This is her seventh book, originally written in Finnish, and translated into English by herself. Tom Stevenson says she has ‘a mind like a steel trap’. There is a lot packed into the 352 pages of this mid-sized but weighty book. From a purely aesthetic point of view, Michael Boudot’s photography is seriously classy and as well as snapping the inevitably glamorous side of champagne, he’s captured some joyful, unguarded moments in the vineyard as well as beautiful portraits of cellar masters and producers. Tuija Jantunen’s maps (oh so very important) are clean, concise and crystal clear. The book itself is structured in a way that is both easy to read through, and logical enough to use as a reference guide or a travel guide. It is as the latter that I can see this book being most valuable. 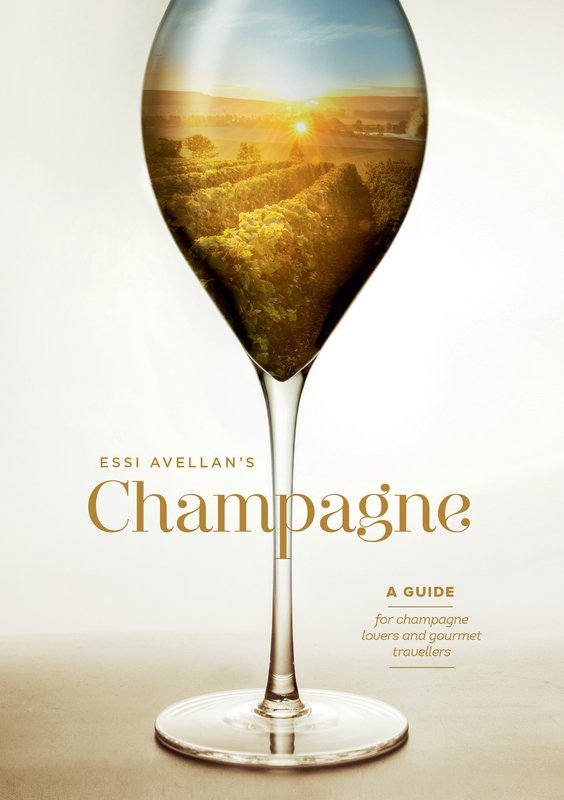 In her introduction, she states that she ‘would be delighted if this book helps you tailor the champagne trip of your dreams’, and the book could help you do pretty much exactly that . The book is roughly divided into two parts. The first half includes everything you would expect: history (very brief); the industry (markets and numbers); power, politics and structure (houses, growers, etc); winemaking; styles; storage and drinking; and vintages. All this is covered briskly with crisp, easy confidence and great clarity. It does not go into great depth – I get the sense of being whisked through the mandatory formal stuff, before she can fling open the doors to the real party – but that is not to say she glosses over or botches the facts. There is enough there to make any champagne drinker feel very well informed. There is also a chapter on ‘Planning your trip’, which is useful and practical, covering (in the same rapid-fire fashion) transport, gastronomy, visiting etiquette, and a handful of worthwhile events. At the end of this are three pages of what she calls ‘Fixed Day Programmes’ – effectively seven days of detailed, hour-by-hour ‘champagne trails’ which have been so cleverly devised that they include not only visits to champagne producers but lunch spots, walks in beautiful parks and forests, wine bars, museums, river cruises, wine bars for aperitifs, restaurants for dinner and hotels. If you’re short of time for planning, booking, and travelling, these are worth the book’s weight in gold. Avellan has also given her readers rather nice ‘list boxes’, which help to provide single reference points for key information such as who owns whom, what those abbreviations mean, and the grand cru villages. She is strong on single vineyards – as you would expect from someone who must have breathed single-vineyard champagne for at least a year! – and has provided a great list of ‘Notable single-vineyard champagnes’ (itching to be made into a collector project or blind tasting line-up…) as well as a list of champagnes made from ‘forgotten grapes’. The second half of the book is devoted to an exploration of the region. She’s divided this into four geographical chapters: Reims and Montagne de Reims; Vallée de la Marne; Épernay and Côtes des Blancs; and Aube. Each chapter starts with a series of profiles on selected producers in the region, and then finishes with a map of the region, and then a few pages on personally recommended hotels, restaurants, bars and wine shops. Avellan is at pains to state that the 65 producers she profiles are not necessarily the top 65, neither are they all visitor-friendly. She writes, ‘I have preferred to give a comprehensive overview of geographically and stylistically different producers … carefully selected to facilitate your choice.’ While she has included some iconic champagne houses who do not usually welcome visitors, others are included mainly for the quality of the visitor experience. Each champagne house or grower gets at least two or three pages, covering a bit about their history, philosophy, people and wines. She chooses one wine ‘that best captures the very essence of the estate’, and devotes a page to that particular wine, its winemaking, origin, story, style. She also gives a score and drinking window, with some indication of whether the wine will improve with age and by how much. Avellan also includes scores and projected ageing potential for the current cuvées released by the house/producer. Finally, on a very practical level, she lists the website, address, phone number, annual production in bottles, cellarmaster name, and visiting information (seasons/days/times, tours, languages, booking requirements, costs). Each producer is also graded from five stars (top producer) to one star (basic producer), although she doesn’t list any one- or two-star producers. Her five-star awards considerably outnumber the threes and fours. This may not be the top 65 producers of champagne, but it’s still a pretty starry line-up. There are six cellarmaster interviews with the likes of Jean-Baptiste Lécaillon of Louis Roederer and Cyril Brun of Charles Heidsieck. They are simple, just three or four questions, but in a region where the men and women who grow the grapes and make the wine are more disconnected from wine drinkers than any other region, it’s a small human touch that somehow brings a bit of warmth into the cold polish of champagne. Coming after the producer profiles, her coverage of do/see/eat/stay is not going to put the Lonely Planet champagne guide out of business, but if you’ve got this book, you’re not going to need the Lonely Planet as well. Rated using the same five-star system as she uses for the producers (top/luxury to simple), each restaurant and hotel is selected from personal experience or thanks to an insider tip. Every hotel, restaurant, bar and shop comes with a thoughtful, often enthusiastic summary of the place, giving the reader little details that help to inform their own choices. As with the producers, clear contact details are given along with opening times. Her choices are carefully balanced between high end and what I would call mid priced. It’s my observation that this is not a book for the budget traveller. But then, I suppose, most fizz-loving budget travellers would be heading for the Veneto. My one big complaint is that, as a travel guide/planner, the book isn’t as navigable as it could be. The gold tabs at the top of each page, designed, I assume, to act as handy thumb indexes, are fiddly because they’re all gold with white font (colour-coding for each region/section may have been more useful) and you still have to flip through the entire regional section to find the particular shop or producer that you were looking for. The producers seem to be profiled in some sort of rough geographical-cluster order, judging by the map (although producer #14 in Reims defies that order), but to find a particular producer you have to go to the small-print index at the back and the same applies for hotels, restaurants, shops, etc (in which case you’d better remember the name of that shop). My copy will probably just end up with a lot of folded pages and grubby post-it notes sticking inelegantly out the top. There is also no index or contents listing that allows you to get straight to the maps or to the handy tables and boxes. When I went back to find the single-vineyard list, I flipped through 60-odd pages before I found it again. I’ve already alluded to it, but for a champagne lover on a shoe-string, I’m not sure this book would be the friendliest buy. For one, Avellan doesn’t waste too much ink on price guides. Apart from the odd mention, such as the €300 price tag of Armand de Brignac, it’s as if price is too vulgar to discuss. Or of no relevance. It’s the same with restaurants, although to a lesser degree with accommodation. One might be tempted to draw the conclusion that the number of Avellan stars has a directly proportional relationship to the number of stars your banker might be seeing should you pay a visit, but this is not so. There’s a significant difference between the £40 NV cuvée of the five-star-rated Jacques Lassaigne and the £140 NV cuvée of the five-star-rated Krug. One three-star restaurant offers a set menu at €19 for three courses, another €32 for two courses. If you’re on a strict budget, and want to save your money for bringing home a couple of special bottles of champagne, you’re still going to have to do quite a bit of research. Despite these carps, the book is immensely approachable, made more so by the moments when Avellan slips herself into the pages, and you get that chink of humanity glowing through the cool, immaculately airbrushed face of champagne. If anything, I was hoping for just a little more from Essi Avellan. I was hoping that she of all people might get a little under the skin of the place, show us a bit of Champagne Unplugged. But the maquillage is firmly in place, and the celebrities remain at arm’s length. So we may not be any closer to the gritty heart of champagne, but she gives us a great view of the red carpet.